A year ago, a Florida proposal to decouple greyhound racing from other forms of gambling stalled on the last day of the legislative session. Even though the measure had passed overwhelmingly in both the State House of Representatives and State Senate, it lost steam in the final hours and did not become law. I was heartbroken, and knew the failure of this important bill would result in the needless suffering and death of more greyhounds. In fighting for Florida's greyhounds, we assembled a strong and diverse coalition. Supporters included the American Society for the Prevention of Cruelty to Animals, The Humane Society of the United States, Greyhound Adoptions of Florida, and newspapers across the state. The measure was also supported by racetrack owners who are losing money on live greyhound racing. Our coalition remains strong today, and I am optimistic that we will pass greyhound decoupling into law. This change, however, cannot come soon enough for the dogs now at Florida tracks. Sadly, some dogs have already needlessly suffered due to the failure of decoupling legislation. 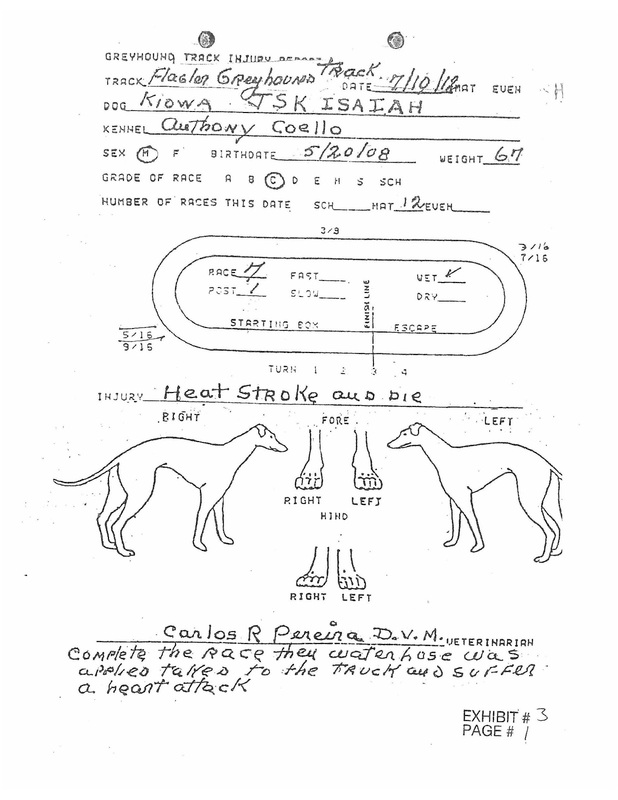 For example, on July 10 a four-year-old greyhound named Kiowa JSK Isaiah died at Flagler. According to records we obtained from the state, he collapsed after winning a race and suffered a fatal heart attack. Isaiah's death was completely avoidable. In fact, it's possible that had decoupling become law in 2011 Isaiah would be lounging on a couch somewhere, living with a loving family. For Isaiah, greyhound decoupling did not come soon enough. I know that greyhound racing will eventually end in Florida, the question now is how long it will take and how many more dogs will become casualties of inaction. Over the past two years, the only real opposition to decoupling has come from greyhound breeders. Of course, these breeders have a direct financial interest in preventing change. The current racing mandate is effectively a state subsidy for their cruel business, and they will do whatever it takes to perpetuate it. 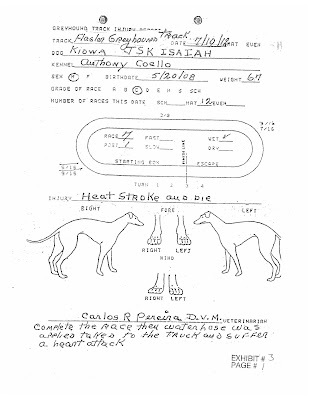 These greyhound breeders have also convinced a small number of greyhound adopters, by using scare tactics, to oppose decoupling. 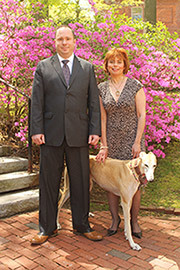 They have made all sorts of wild accusations, including the false claim that decoupling will somehow harm greyhounds. The truth, however, is that doing nothing in Florida is harming greyhounds. Dogs like Isaiah can no longer wait. It's time for greyhound decoupling to pass, so that thousands of greyhounds can be given the second chance they deserve. WHY ARE HUMANS SO DAMN INSENSITIVE AND CORRUPTED BY MONEY AND GREED! IM SO ASHAMED THIS IS MY SPECIES!